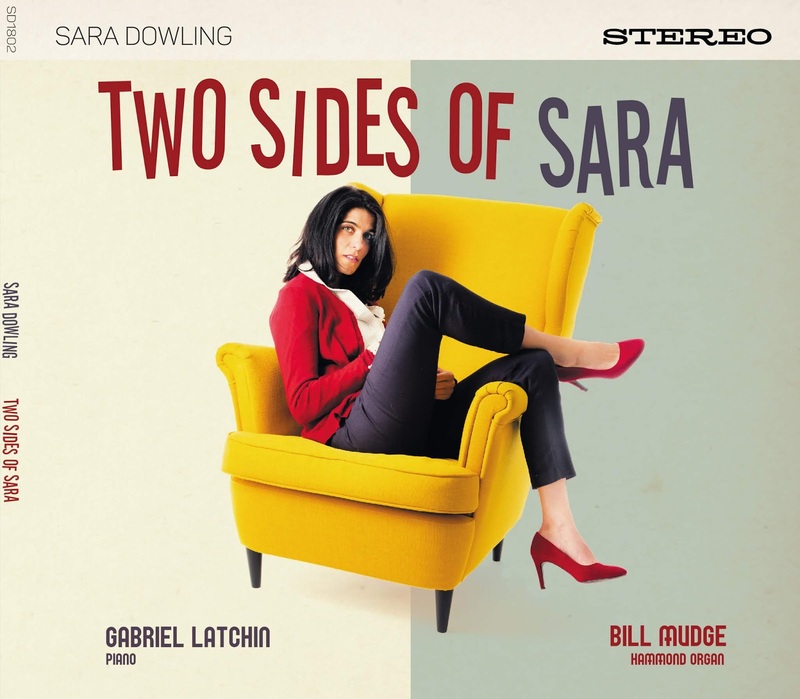 Vocalist Sara Dowling is about to release her second album, Two Sides Of Sara. She spoke to Sebastian about the complexities of heritage, the power of two, the enduring beauty of the American Songbook and finding stories in their dramatic verses. London Jazz News: Please clear up one thing....are you SAH-ra or SAY-ra? Sara Dowling: It’s pronounced Saaaaaaa ra. Ha ha ha! Not Sarah. LJN: You sing “I’m from Missouri too” in You came a Long Way from St. Louis. I was convinced – but where are you actually from? SD: That’s a very good question! Audience members often ask me, “Where are you from?” My response is always, “Ummm, are you asking which part of London I live or where I grew up or where I was born or what is my heritage?” This response is usually met with, “Jeepers, OK, I’m going to guess alright, you’re Italian aren’t you? Spanish? Iranian?” And the list goes on, which makes this question all too entertaining for me at gigs and usually gives me a chance to have a good old natter with these crazy jazz lovers. I am half-Palestinian half-Irish. I was born in Muscat (Capital of Oman). I moved to the UK when I was seven, and lived in Land's End, Cornwall. Then, I moved to Manchester to go to a music school from age 12 and stayed there until I moved to London at 30 and have been here ever since. Voila! LJN: And for a time you were a professional cellist? SD: Yes, the cello was my ticket to Manchester where I attended Chetham's School of Music from age 12-18 and subsequently continued my studies at the Royal Northern College of Music (RNCM). LJN: And this is your second album... how is this one different from the first? SD: Well, firstly, this album is a duo album. Tracks 1-7 are (Vocal and Piano) and tracks 8-14 are (Vocal and Hammond Organ), whereas my first album is with a rhythm section. Therefore, this album is very exposing and a true picture of where my voice was at then. Lord knows, I think my voice has changed since March and June 2017, which was when I recorded the two sessions. In my heart, I felt before recording another big quartet album like my first, I’d like to make a statement. If listeners who buy this album truly love it, then they genuinely like my voice. There are no original compositions, just standards that immediately expose the voice’s ability... and ability to portray sincere emotion with just a piano or an organ to hide behind. As a duo record there is so much room for me to use a great dynamic range and colour… and I like that! LJN: You know a lot of standards – what led to this selection? SD: Well, the standards chosen with organ were songs in my mind that I felt I could either give a bluesy delivery or songs that would allow me to sustain the melody and build to a point that I was able to show the biggest outpour of emotion possible. The organ can facilitate that kind of delivery. It is a mammoth instrument with a wide sound palette; it pushes the voice to a place with no borders. The standards chosen with the piano were songs that I imagined Ella Fitzgerald and Ellis Larkins would have chosen. Songs that sit on a tempo that allows the pianist to play at a slow lilting stride. That style of playing leaves me teary. I also chose songs that Gabriel (Latchin) and I were often playing at the time and seemed to really suit us. Of course it is important to feel an affiliation with the lyrics but I also need to have as deep connection with melody and harmony as I do with lyrics. I’m not a vocalist that learns songs that just suit who I am. That’s why I’ll sing "I’m from Missouri too” like I mean it. On a tangent here: I like to learn huge lists of songs that belong to one composer in order to get the feel of the composer and his style. You can find beauty in all songs if they are written by one of the greats. That’s the beauty of the American Songbook. SD: I love delivering lines in the way an actress would. The verses of standards are the moment for a vocalist to shine in terms of their ability to sing and act/deliver. LJN: Two Sides... why that title? SD: I am a pretty unpredictable person (I’m nervously laughing by the way) so I have many sides to my character, ask mama. However, two sides of Sara are showing the beauty of piano and organ. How the instrumentation alone can bring out a different side of my voice. LJN: What led you to want to record with Gabriel Latchin? SD: I’ve been working with Gabriel since May 2015. I adore his playing and I think he’s an exceptional musician who is making great movements in his own right. He seems to know how to cope with me. LJN: And (organist) Bill Mudge? SD: Well Bill Mudge is very special. He is an extraordinarily sensitive and thoughtful musician. When you get someone like that playing the organ it’s very special, especially in terms of his ability to accompany too. He has great time. To be honest there was only one person for me that could have done a duo album and that was Bill. LJN: And how and where were the sessions? SD: The first session: 8 March 2017, Talbort Studios Bermondsey – Recorded by an amazing organist called Steve Pringle. You will hear how well he recorded the organ. He knew exactly what he was doing. It was recorded to tape too. Steve had to take his shirt off in the control room where the tape machine was placed. It reached 27 degrees Celsius in March! We finished recording at 2am-ish finishing with When It’s sleepy Time Down South. Steve Pringle being a musician is the only kind of person that would agree to be in the recording studio at 2am, but it was special recording at that time of night. There were tears of joy, emotion and fatigue from Bill and I, and memories I’ll cherish always. The Second session: 30 June 2017, Fish Factory in Willesdon – Fish Factory is an incredible space, with high ceilings and lots of wood. I love the old desk there but most of all I love the piano. Many people want that modern pristine sound from the piano but I preferred the Fish Factory’s lovely old Steinway. It’s sound is dark and heavy. That sound for me is reminiscent of all these old jazz records. That’s the piano sound I want to hear when I sing. I made sure to get Gabriel the biggest sandwich possible. He has a fear of being hungry. Go figure! LJN: Song choices… How rare to hear Irving Berlin’s After You Get What You Want – er, don’t you have to be Marilyn Monroe to do that one? LJN: Do you have a residency anywhere? Where’s the most likely place people will hear you? SD: The only regular thing I have going is a monthly appearance with Gabriel at the Wellesley Hotel in Hyde Park on a Friday. My gig calendar is pretty varied and I do a lot of clubs out of town like Susan May’s Clubs. When, I’m in town I mostly sing at the 606 – about three to four times a year, I do the odd warm-up set at Ronnie Scott's and a few times a month I sing at the NED. LJN: Would you do this programme live too? LJN: You’ve got a live George Shearing programme – and a Jerome Kern set too. What’s the story there? SD: Well I adore George Shearing mostly because my father listened to him a lot and I’ve enjoyed taking his quintet arrangements of song with vibes and mould them round a vocal. As for the Kern show, well I have several different shows: Jerome Kern, Cole Porter, George/Ira Gershwin, Judy Garland. This is my crusade to maintain the beauty of the American Songbook and not allow that incredible collection of songs to be lost. I love composing and I wrote two originals on my first album, but right now, where I’m standing I think a jazz singer should have a healthy repertoire. It’s part of the job description and part of being a jazz musician. Call me a traditionalist! LJN: How/where do people get hold of the album? SD: Well my website (see LINK below) is the best place to go at the moment. ITunes and Amazon will be the next part of this journey. You can buy physical copies from my site or download the digital version from 10 August 2018.